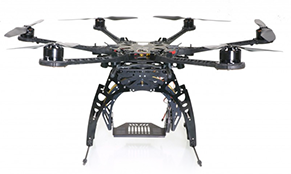 Want to Become Certified to Operate Drones and Unmanned Vehicle Systems? Anyone can enroll, no experience is necessary -- a background in math and science is encouraged. Certifications are taught by PhD's, Real life Top Guns, UAV Engineers and experts with over 500 years and 60,000 hours of combined experience. Unmanned Vehicle University (UVU) is focused on exactly what you need to excel as an employee or a business owner. Unmanned Vehicle University students tell us the difference between Unmanned Vehicle University and others is HUGE! Most of the faculty at UVU have PhDs in engineering and combined experience of over 500 years. The UAV instructor pilots have combined experience of over 60,000 hours in Predator, Reaper, Global Hawk, Hermes, Heron, Aerostar and many small UAVs. You'll obtain the training to manage the unmanned systems of the future (like the X-47 UCAS). Unmanned Aircraft systems engineers are critical to the positions of technical management and development of complex unmanned aircraft systems. 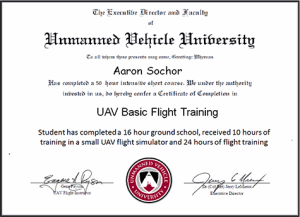 "Unmanned Vehicle University taught me the practical education for entry into the UAS industry. I was offered a great job with a large UAS manufacturer and operator while still actively perusing my MS degree in systems engineering with the university. 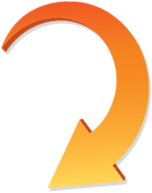 The courses are online, the instructors are the most experienced that I have found anywhere, and I highly recommend them." "While I have dabbled in UAVs, I needed a foundation. 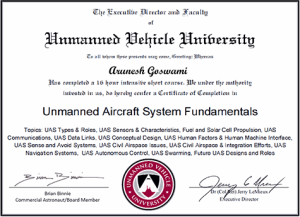 I highly recommend the UAS Fundamentals course. Dr. LeMieux has a military and educational background which he uses in true military fashion to present the material clearly concisely and with the purpose to educate the student on all things UAV. The material is presented such that no matter your mathematical background, you’ll comprehend, learn and be ready to apply it. In order to achieve your education goals, the comprehensive class materials are provided to the student on a DVD allowing for further research and self-study. I plan to take more Unmanned Vehicle University classes and can highly recommend the course." Fill out the form below to learn how to fly the future of drones and unmanned systems. Full Name: Phone Number: Email Address: Have you served in the Mililtary? No cost. No obligation. We promise not to spam you or give your contact information to a third party.